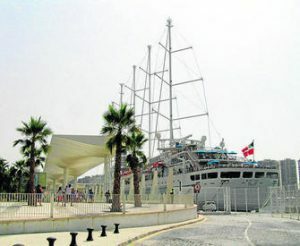 Integrated in the area Palm garden of Surprises, this facility will bring tourist ships to the dock of Marquis de Guadiaro, a dock which for many years was regarded by the international cruise industry as the second most attractive in the world for the berthing of this kind of cruises. The new maritime station will focus on small luxury ships of not more than 200 meters length, and is a perfect complement to the berthing areas near Pier One, where are mooring the large cruise ships. Pier Two will focus on a very exclusive market of ships; boats that might well be called high-end and complete to perfection the offers for cruise ships in the port of Malaga. As mentioned before, the Port of Malaga is located in a prime location and close to most of the attractions of the city. Visitors can walk to the historical centre with numerous old buildings, museums and the Renaissance cathedral; or enjoy shopping, bars, restaurants and nightlife around Calle Larios. Also very close by is situated the Arabic fortress Alcazaba, situated on a hill with fantastic views of the city and the bay. Or you can walk to the beach of La Malagueta, where is available a wide range of cafes, bars and restaurants. All this is within your reach just a few minutes’ walk from Pier Two.